The Ellis family’s connection to Platt is principally through Daisy Ellis, who was born in East Peckham and married Alfred Leonard Parris, who himself had moved to Platt from Offham. Robert, Daisy’s father, was a farm labourer from Goudhurst and went with his wife Margaret Ann Ellis (née King) to East Peckham in the late 1880’s. Daisy’s older brother, Robert James Ellis (who was usually known by his middle name) was born on 2 July 1887 at 1 Johnson’s Cottage in East Peckham, and the eldest of 16 children. By 1901 the family had moved to Yalding, where young James found employment as a domestic houseboy. In 1907 his younger brother Edwin enlisted in the Royal Field Artillery, and it seems likely James followed in his footsteps shortly afterwards. Along with Edwin, James was enumerated in the 1911 census at the Louisburg Barracks in Bordon, Hampshire where he was serving as an acting bombardier with the 126th Battery, Royal Field Artillery, which was the second of four consecutively numbered batteries of the 29th Brigade. A year later, while still in the Army, James married Ella Louisa Knight at the parish church in Platt, and they subsequently had three daughters named Louisa, Florence and Daisy. In the summer of 1914, James was in the Army Reserve when he was mobilised for active duty at the outbreak of war in August. The 29th Brigade was under the command of the 4th Division; however, James was immediately transferred within the division to the 14th Brigade, which was also part of the pre-war Regular Army, and consisted of the 39th, 68th and 88th batteries. The Division initially held back from crossing the channel by a last minute decision to defend England from a possible German invasion, however when it became evident the danger had passed, this was reversed. By the night of 25 August, II Corps of the British Army was in full retreat from Mons and hotly pursued by the German First Army. The 4th Division was hastily brought forward, and the 14th Brigade formed part of this new force, soon finding themselves engaging the enemy on the 26th when all three batteries went into action on land west of Le Cateau. 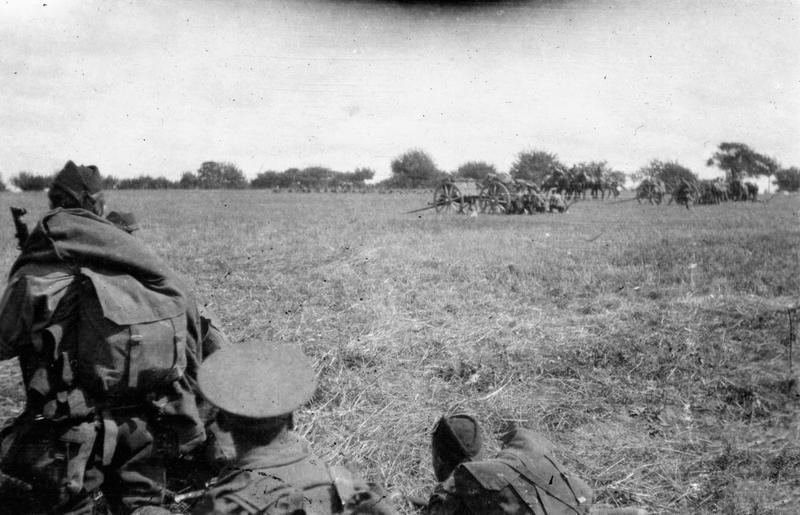 Heavily outnumbered, and largely due to the efforts of the artillery, the British managed to hold off the German advance in a heroic rearguard action before retreating themselves shortly after 6:00 pm. 3:40 am moved to take up a position, 88th Battery came into action, did not fire. 9:15 am Marched towards Signy-Signets where enemy was seen retiring. Enemy’s artillery opened fire on our troops at 11:30 a.m. Enemy’s artillery well hidden. 11:50 am 88th Battery opened fire. This battery was delayed by 1st Line Transport of Infantry Brigade which was shelled on road in front of our artillery. Soon afterwards 39th and 68th Batteries came into action and were engaged. 2 pm Fire slackened and 39th and 68th were withdrawn with XI Infantry Brigade behind Le Ferté Sous Jouarre where both batteries camped for night. Immediately following the Marne, James was in action again at The Battle of the Aisne, which took place between 12 and 15 September. The brigade had established positions along a line north of Venizel, with all batteries engaging the enemy throughout the four-day assault. The German Army had the advantage on the high ground, with their artillery possessing full field of fire, whereas the British artillery was forced to take up less suitable positions that commanded few direct views of the enemy. The Battle of the Aisne involved high casualties on both sides and resulted in little forward movement. Further along the line, the French had a similar experience, with artillery, machine gun and rifle fire making it almost impossible for any direct frontal assault on the enemy’s trenches without incurring severe casualties. The battle ended in stalemate and marked the start of trench warfare, with the lines established at the Aisne remaining relatively unchanged for the next four years. We moved again and came into action just in front of the village of Flêtre. We have a terrible battle here, but we manage to put the Germans to fight. At dusk, we leave our guns in action and get to a farm to get a meal and rest. Very wet but the men in good spirits. The attack at Flêtre was the first in a number of engagements that were collectively known as the Battle of Messines, which in turn was part of a series of actions that eventually decided the line of the western front collectively known as the Race to the Sea. After making good progress at Messines, the Allies were ultimately pushed back to the Messines Ridge which was subsequently abandoned on 1 November. In the absence of any surviving service papers, we can only speculate as to precisely where James would have been over the next year. He was very likely involved in the 2nd Battle of Ypres in April 1915 where he would have witnessed the German’s first use of poisonous gas as a weapon. At the start of November 1915, while based at Mailly-Maillet on the Somme, James was part of an exchange with the 125th Brigade RFA and joined ‘C’ Battery which was eventually re-designated ‘A’ Battery, 124th Brigade in June 1916. James’s brother Edwin, who was also in ‘A’ Battery, was killed by a shell near Arras at Bienvillers on 29 June, with James reputedly being present at his burial. That autumn James returned to the Somme and took part in the Battle of the Ancre. The following spring, the 124th was in action at the Second Battle of Arras, which was a British offensive that took place between 9 April and 16 May 1917. 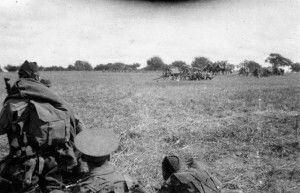 On 12 April the brigade covered an attack on Wancourt Ridge, with ‘A’ Battery taking up a position near St. Martin-sur-Cojeul eight days later. During 20 April the battery was heavily shelled and suffered 11 casualties, one of whom was James. He had survived almost three years at the Western Front when he was killed, and his body buried in the Hénin Military Cemetery Extension a few miles to the south-east of Arras.